↓These ruins were related to the unsolved Crop Circles in 2007. The related one is the pattern of N0 312. These ruins were related to the unsolved Crop Circles in 2007. Many small triangles in No312 show small bad guys= the angels in Vega. 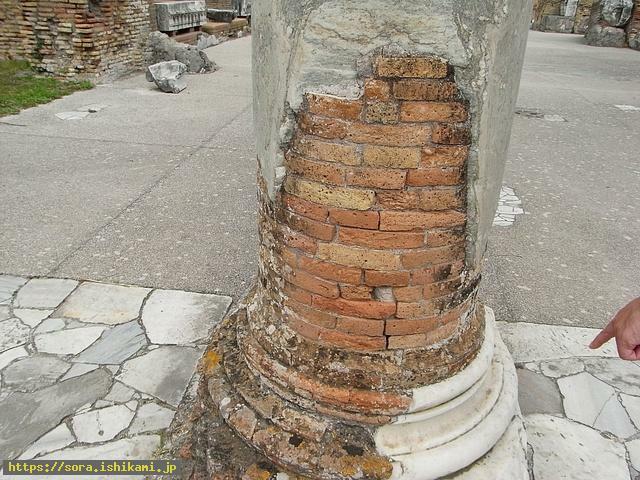 This is the pillar, the center of which is still bricks and the other part of which have turned into marble. 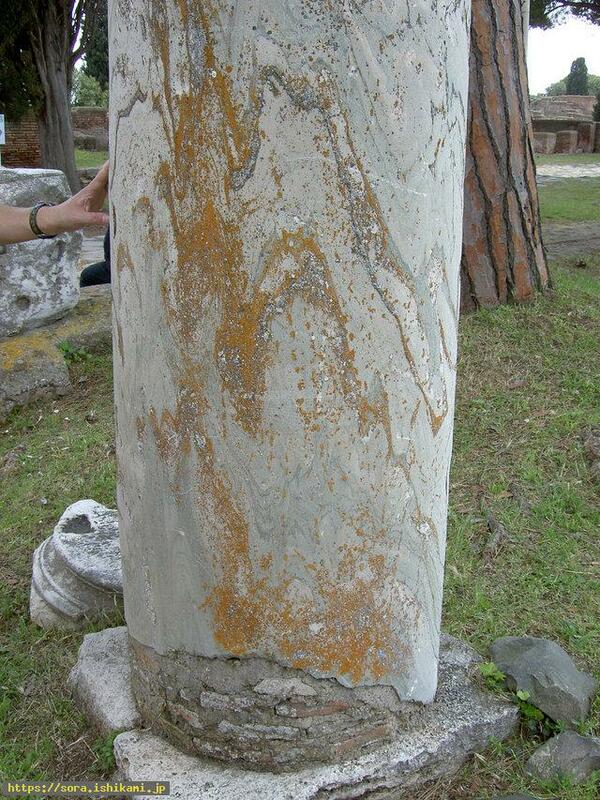 This stone column was made in order to show each atom has thoughts by turning into the material according to their hope. Though I thought it was made of monolithic, I found the inside of it is formed by bricks but I was told the surface was made by the kneaded powder of the component of marble which was plastered on the bricks. In addition, Saran Wrap(plastic)cling film was put on it. The long and short of it, the atoms of the surface seem to have changed into the component like Saran Wrap(plastic)cling film. There are　some who explain the mason was poured from the hole in the land but such figures were never made by the mason's pouring into from the hole. These are the figures of Stone humans which came out when the land was dug. People in Italy say, "See Naples and die." 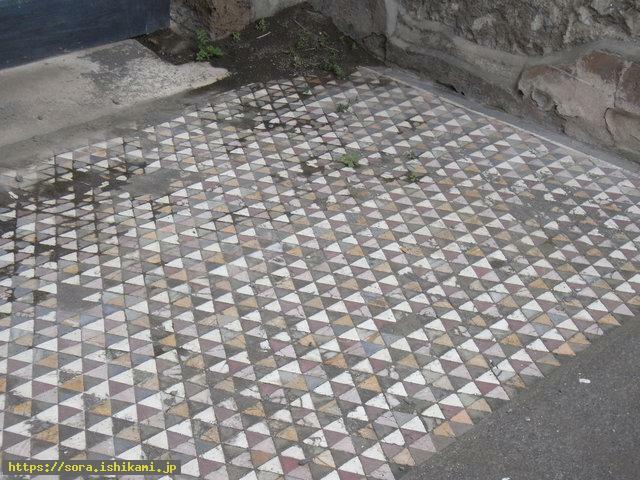 As there is Pompei ruins in Naples, the proverb means we should know there was the culture of Stone humans before the one of humans. I noticed for the first time when I was pointed out about this pillar. 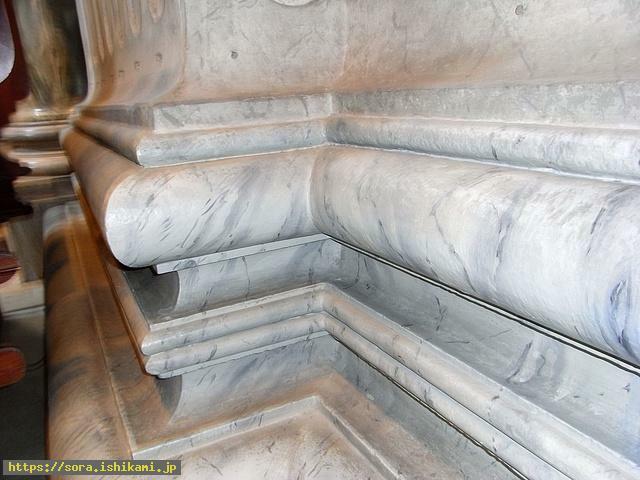 Though the outside seems to be the component of the marble, the central contents was bricks. Here is the stone implements for making the powder of stone and I was told the usage of it by the beings from the stars. The brown moss expresses the color of Stone gods. The skin of the pine tree in behind is not like the scales when it is compareed with Japanese ones. This ruins have been left very neatly. 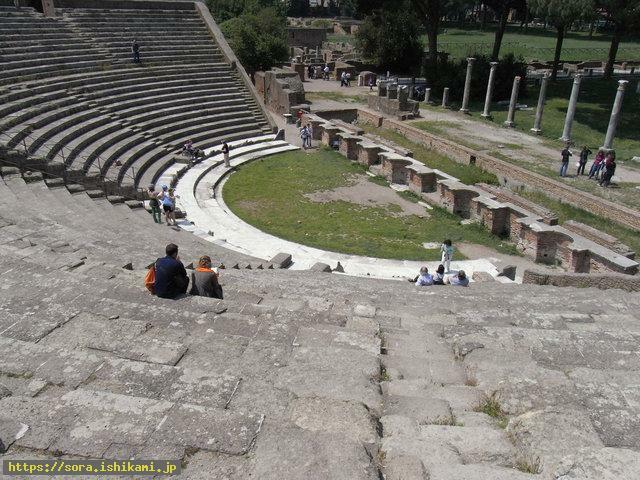 It is the ruins which is broader than Pompei ruins. 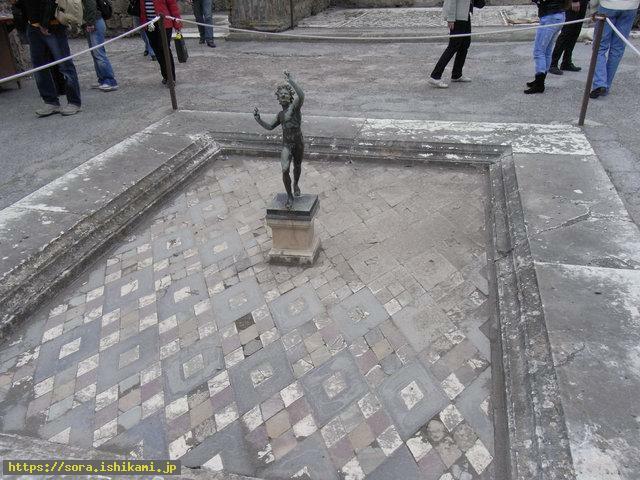 Mosaic images which show the lower body like a snake have been left clearly. The surface of the bricks is plastered securely because humans are apt to think the brick masonry has a tendency to fall over easily and the upper part had been broken. Therefore people may misunderstand there had been the upper part like the roof. This structure shows this is the original figure which existed from the beginning. 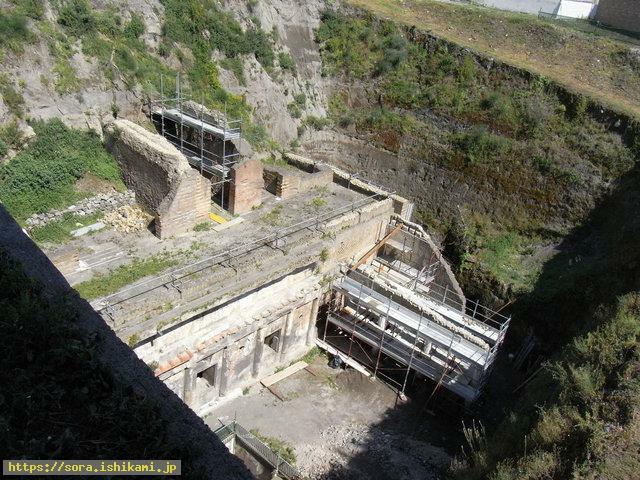 It shows it is not the building in which humans were living but it is the underground city for Stone humans. This is the place whose photo I was asked to shoot by the beings from the stars. 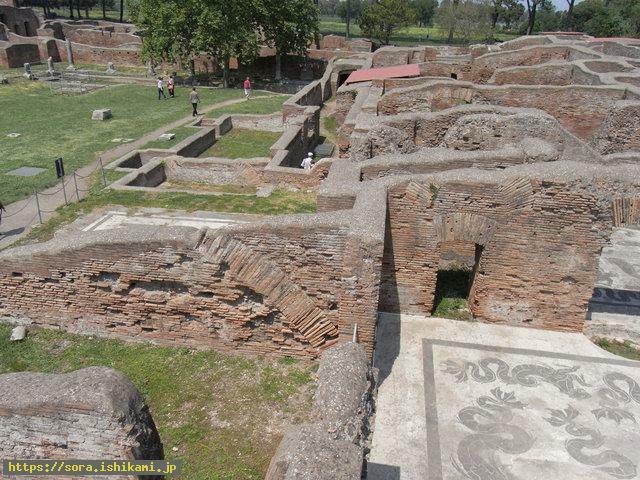 It is the ruins near Pompei and the beings from the stars told me not to forget Pompei was in the underground like this. 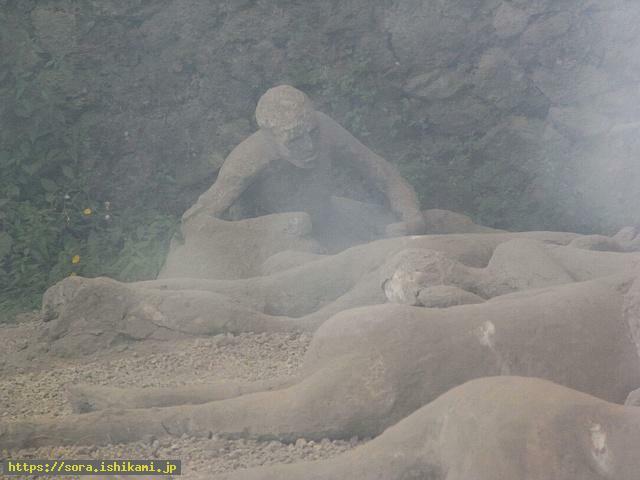 That means it was the underground city for Stone human even though it was buried by the volcanic ash. 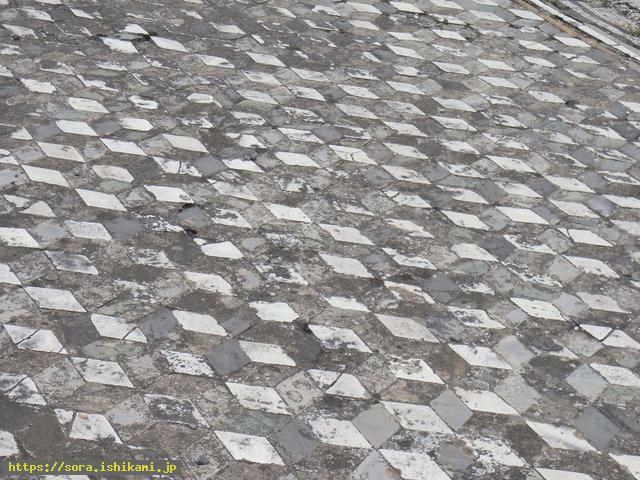 The black color of the volcanic ash seem to corresponds to only a part of it. The atoms of Stone human which wanted to become humans gathered together on this table and they turned into humans. The Stone humans of stone columns sent energy to those humans who were about to be born. 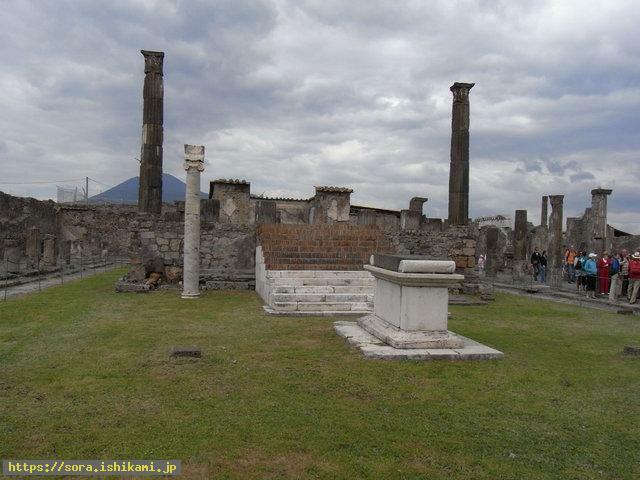 Mount Vesuvius volcano can be seen at the back. It is the bronze statue with a tail and the sinister face. It is Minashigo which is smaller than Minanoko(small groups of atoms) of Sirius and I was told he had done evil deeds as he had got angry because he had not been able to participate in Atlantis.